CL: What kinds of discoveries does sound facilitate? Or, where does sound take you? AR: I’ve had the great benefit to participate in what I’d call workshops in walking. Toronto composer Darren Copeland lead a great soundwalk at an acoustic ecology retreat near Haliburton, Ontario four or five years ago, and Buddhist monk Thích Nhất Hạnh lead mindful walks at Village des Pruniers in southern France three years ago. Both experiences encouraged a corporeally and environmentally aware practice of slow, attentive walking. 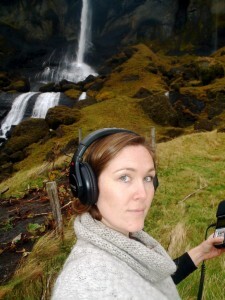 Since then, I’ve enjoyed going on soundwalks in rural places (with little to no human sounds present). When I’ve hooked up my recording equipment, my ability to focus attention primarily on sound has created personal experiences where I feel unattached to time and where I tend to catch myself in slack-jawed, wide-eyed wonder (literally!!). One of the first big things I noticed in paying attention to soundscapes is just how prevalent, constant, loud, and dominant human-created sounds can be. If we apply Bernie Krause’s neologisms of geophony, biophony, and anthrophony, the anthrophony frequently overpowers the other two -phonies and subsequently interrupts and impacts biophonic communication. It’s incredible (distressing, humbling, agitating, activating) to witness. To answer your question of where sound takes me, it’s much closer to an immediate and innate understanding of our human impacts on the ecosystems in which we exist, interconnect, and inter-depend. Sound is accessible now, and constantly reminds: my em/urgency. Now.